Inky maroon in color. On the nose, mint is very strong, but not as strong as the waves of blueberry jam pouring off of it. There’s some coffee there at the end too, but really this is all about the minty blueberry madness. The palate presents juicy, sweet blackberry fruit, roundly passive tannins and a dark chocolate finish of medium length. This is a fairly rich wine, not flabby but certainly chubby. But hell, I’m not one to be snotty about a wine that carries a few extra pounds; I liked this one. With the carnitas, which I thought would be a nice pairing if the wine was pretty tannic, this Petite Sirah was so-so. I screwed myself by squeezing some fresh lime over the meat, and frankly the wine didn’t have the acid to handle it. The gorgonzola-mashed squash was a nice pairing, as there was relatively little cheese and the sweetness of the squash synergized (to repurpose a BS business word) with the ripeness on the wine. The cornbread was from a mix, so it was sweeter too, and it plus the muted fire of the poblano also really went well with the wine. It stood up to the chile better than it stood up to the lime, that’s for sure. Peirano Estate is an interesting mix of old and young: their estate of 300 acres of Lodi vines has been in the family since 1895, but Lance Randolph (his mother was a Peirano prior to marriage) only started bottling wine in 1992. The family’s Zinfandel vines are over 100 years old. I can’t tell how long ago they planted their Petite Sirah, but it is estate grown. Their website has a strong 90s-era feel, with little backstory about Lance, who is both owner and winemaker. For this wine, he uses a rotary fermentation, to maximize extraction. I didn’t know you needed help extracting PS, but there you go. That plus twelve months of French oak, and Bob’s your uncle. Oh, and the grapes are harvested by hand, which arguably makes for much better wine: less beating up of the grapes before it gets to the press, and all that. 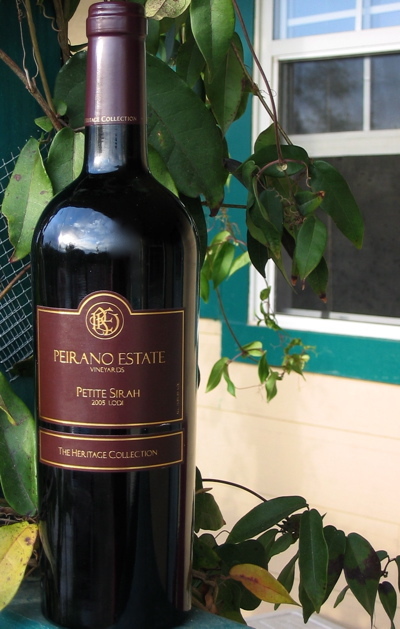 Peirano is pretty well known for their blend “The Other,” usually a combo of Syrah, Petite Sirah, and Cab. Reviewed here and on Wine Library TV, in a very early episode. As you may remember from my treatise on Petite Sirah when I reviewed the Rosenblum, the grape tends to be less fruity and more tannic, overall. Also called Durif, Petite Sirah is “petite” in its berry size: the grapes are small and the skins are thick, resulting in a higher skin-to-juice ratio than you get on other wines, and thus more tannin and color. I mentioned in that post that hotter climates do well with PS, and Lodi certainly fits the bill. This is a real crowd-pleasing, reasonably priced Petite Sirah, one with which to introduce friends painlessly to the variety. I love “Chubby” as a variant on “flabby.” We may need “pleasantly plum” in there, too! That lime must have been unpleasant with PS! Like being pulled in two opposite directions at once. Great review! That should have read “pleasantly plump”–although maybe “pleasantly plum” is also apropos. What an excellent description of the wine you chose. But personally, I’m very interested in the gorgonzola acorn squash. We love acorn squash in my house, but I’ve never seen it prepared this way. Care to share the recipe? Thanks for participating! I have put a link to your blog as a paticipant in WBW. Check Out WWWBW at http://www.squidoo.com/womenwinewriters and leave a comment, get inspired or link to it or tell your friends about it or just ignore it. The choice is yours! Bake the squash (acorn, but butternut would work too) in halves, shell side up, on a greased cookie sheet — I think I do 400 for 45 minutes, or until tender. Cool until you can pick up the squash half (sometimes I use an oven mitt if Extreme Measures are called for) and scoop the squash out of the shell. Reserve the shell if you are Fancy Like That. Crumble gorgonzola or other bleu cheese into the squash and stir violently. I add about 1/4 cup cheese to one acorn squash. You want to stir with verve to encourage the cheese to let go of its chunkiness and melt smoothly into the squash. If you’re using a drier style of bleu than gorgonzola, you can tump some butter in there. Salt, pepper, and a judicious dash of nutmeg is delightful as well. 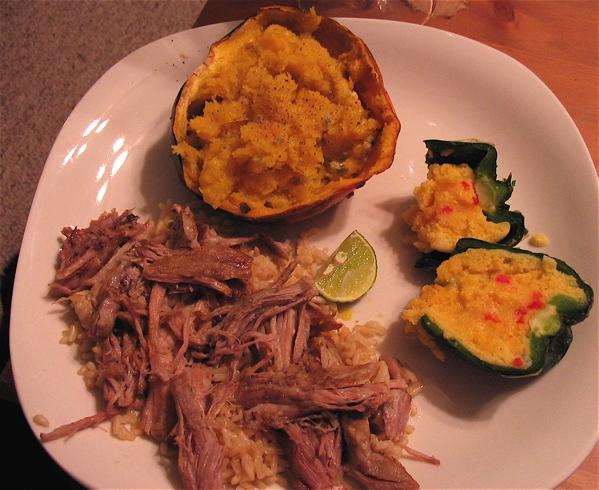 If you’re Fancy Like That, return the mashed squash to the shell, serve, and enjoy!